Ann Putnam, age 12, was the primary accuser of many victims including our relatives John and Elizabeth Proctor, Frances (Alcock) Hutchins, Rebecca Nurse and Susanah Martin. Ann is related to our family as well. She was the 2nd great grand daughter of Richard GOULD. In addition, Capt. Robert ANDREWS’ son John married Sarah Holyoke. Ann was Sarah’s great niece. Sarah’s sister Ann married Lieutenant Thomas Putnam (Richard GOULD’s grandson) on 17 Oct 1643 in Salem, Essex, Massachusetts. Their son Thomas Putnam, (1652 – 1699) was a principal villains Salem witch trials. Thomas was the husband to Ann Carr, and father of Ann Putnam, Jr.. Thomas’ brother, Edward, also participated in the witch trials. Common history has painted Ann and her young peers as selfish, vicious fakers who fueled the witchcraft trials out of boredom or spite. This portrait, however, is somewhat flawed as it appears that, in Ann’s case at least, the parents of the afflicted must have had a strong influence with the child, as did the other adult accusers. Initially, Ann was fed names by her parents and minister. Ann claimed to have been afflicted by sixty-two people. She testified against several in court and offered many affidavits. Ann’s mother, would also become afflicted at times, and was in court almost as much as her daughter and servant. The mother and daughter Ann were a particularly formidable pair of actors. People from miles around trooped into the courtroom to watch their performances. Her father was an influential church leader and became an aggressive accuser of witches. The influence of the Putnam’s became evident as the trials went on. Most of the afflicted and the accusers had some kind of a relationship with the Putnam’s. A great number of those accused by the Putnam’s previously had disputes with the family. A recent handwriting analysis of the depositions of the afflicted girls has shown that some 122 of them were written by Thomas Putnam. While it cannot be known to what degree the accusations made in those depositions were influenced by Putnam it is clear that Putnam had the opportunity to shape the words of the young accusers as he saw fit. Further, the similarity in language across these depositions suggests that some of the language might be that of Thomas Putnam rather than that of the afflicted girls themselves. In the depositions taken by Putnam, the afflicted often claim to be “grievously afflicted” or “grievously tormented” and “beleve in my heart” that so-and-so is a witch. 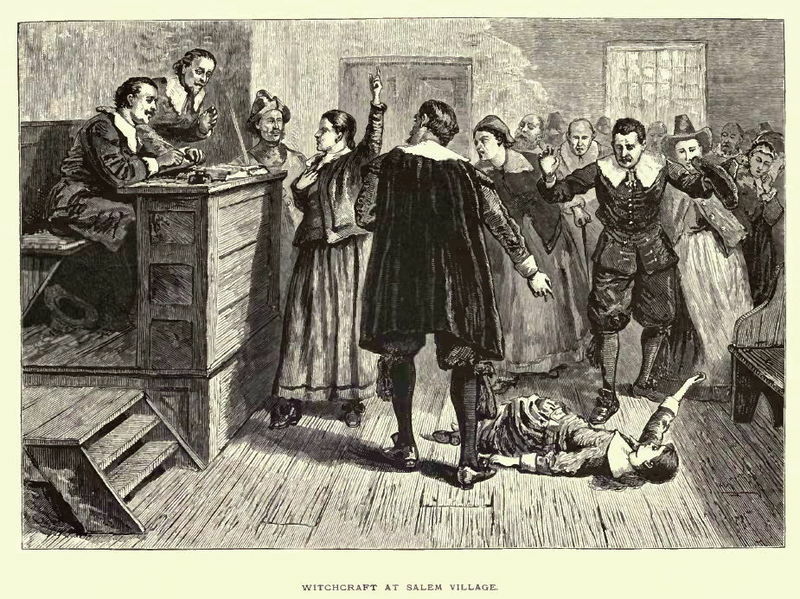 The accused are often referred to as “dreadful witches or wizards” in the depositions taken by Putnam. The frequency with which these phrases can be found in the depositions written by Putnam furthers the theory that they might have been more strongly influenced by Putnam that was previously recognized. Taken in conjunction with Putnam’s letters to the judges and his efforts to secure warrants against many of the suspects, this new evidence further demonstrates the remarkable influence Putnam had on the shape and progression of the trials. When her parents died in 1699, Ann was left to raise her nine siblings aged 7 months to 16 years. Putnam never married. John FOSTER Sr’s son-in-law, John DeRich, was a principal accuser in the Salem Witch Trials. Perhaps he can be forgiven for lying to save his own life as his mother was imprisoned in Boston, his father had just died and he was only sixteen years old. In fact, he may well have been imprisoned himself after his mother, Mary. He married John Foster’s youngest daughter Martha six years later 25 Oct 1698. On May 23, 1692 “Lt. Mathaniell Ingersall and Thomas Rayment both of Salem Village yeoman Complained on behalfe of theire Majest’s, against Benjamin procter the son of John Procter of Salem Farmes, and Mary Derich the wife of Michall Derich and daughter of William Basset of Lyn and _____ Pease the wife of Robert Pease of Salem weaver for Sundry acts of Witchcraft by them Committed on the bodys of Mary Warren Abigaile Williams and Eliz Hubbard &c of Salem Village, whereby great hurt is donne them therefore Craves justice.” On the same day a warrant for arrest was issued. “To the Marshall of Essex or dept or Constables in Salem. You are in theire Majest’s names hereby required to apprehend and forthwith bring before us Benjamin procter the son of John Procter of Salem farmes and Mary Derich the wife of mic’l Derich of Salem farmes husbandman, and Sarah pease the wife of Robert Pease of Salem Weaver who all stand charged of having Committed Sundry acts of Witchcraft on the Bodys of Mary Warren Abigail Williams and Eliz. Hubbert of Salem Village whereby great hurt is donne them In order to theire examination Relating the abovesaid premises and hereof you are not to faile Dated Salem May the 23′d. 1692.” Singed by John Hathorne, Johnathan Corwin. George Herrick, Marshall of Essex, appointed John Putnam to be his deputy to serve this warrant. A separate arrest warrant was made out the same day for Sarah Pease for acts of witchcraft against Mary Warren. “I heave aprehended the parson mensioned within this warrant and heave broghte hir,” signed by Peter Osgood Constable in Salem May the 23: 1692. They were questioned the same day, though no notes still survive and several prisoners were ordered transferred to Boston. Mary ESTEY, Susannah Roots, Sarah Basset, Abigail Somes, Mary DeRich, Benjamin Proctor and Mrs., Elizabeth Cary. and While Mary was in prison in Boston, John’s father Michael died. Mary was later transferred to Salem jail. Some genealogies state that Mary died 19 Aug 1692 – Salem, Essex, Mass, but she doesn’t appear in lists of the victims and other genealogies say she died 10 Feb 1701 – Marblehead, Essex, Mass or after 1712. That summer with his mother in jail and his father dead, John accused his aunt Elizabeth Proctor (Our ancestor John PROCTER’s daughter-in-law) and many other victims of the Salem Witch Trials. His mother Mary Basset DeRich was Elizabeth Basset Procter’s sister. John at that time was apparently only about 16 years of age and intimidated, but never a member of the original conspirators. In fact, he may well have been imprisoned himself after his mother, Mary. John Doritch aged 16 years or thereabouts Testifieth and Saith. That John Small and his wife Anne both deceased and formerly of the Towne of Salem doth both appear to this Deponent and told him that they would tare him to peices if he did not goe and Declare to Mr. Harthorne that George Jacobs senior: Did kill them: and likewise that Mary Warren‘s mother did appeare to this Deponent this day with a white man and told him that goodwife Parker [Alice Parker] and Oliver did kill her: and Likewise Core Procter and his wife: Sarah Procter Joseph Procter and John Procter did all afflict this deponent and do continually every day sense he hath began to be afflicted: and would have him this deponent to sett his hand to a Booke but this deponent told them he would not: Likewise Phillip English and his wife Mary doth appear to this deponent and afflict him and all the aboves’d persons Thretten to tare this Deponent in peices if he doth not Signe to a Booke: Likewise Goodwife Pease and Hobs and her daughter Abigail doth Afflict him and thretten the same: and Likewise a woman appeares to this Deponent who lives at Boston at the Uper end of the Towne whose name is Mary: she goes in black clothes hath: but one Eye: with a Crooked Neck and she saith there is none in Boston like her, she did afflict this deponent but saith she will not any more, nor tell him her name. – Jurat all relating to the prisoner at the Barr. The painting above was created by Thompkins H. Matteson in 1855, and is based on the accounts of George Jacobs’ granddaughter. On the left of the painting is William Stoughton, who was the chief magistrate and went on to be a Governor thrice in Massachusetts. George’s principal accuser was his own granddaughter, who was accusing George in order to save her own life. Jacobs’ daughter-in-law is the woman standing who is being held back. She was thought to be mentally ill. The judge who is leading the accusation is thought to be an ancestor of Nathaniel Hawthorne, John Hathorne, who holds a book and points at George’s granddaughter as if challenging her to substantiate her earlier written statements. George is in the front left with his arms outstretched. In the foreground are a girl and boy who are having fits allegedly caused by Jacobs’ wizardry. The boy may be John DeRich and the girl may be Jacobs’ servant Sarah Churchill or a principal accuser Ann Putnam, Jr.
John Also Testified Against Giles Corey. DeRich claimed Corey participated in “the sacriment” at a gathering of witches. Giles Corey (1611 – 19 Sep 1692) was a prosperous farmer and full member of the church in early colonial America who died under judicial torture during the Salem witch trials. Corey refused to enter a plea, and was crushed to death by stone weights in an attempt to force him to do so. According to the law at the time, a person who refused to plead could not be tried. To avoid persons cheating justice, the legal remedy for refusing to plead was “peine forte et dure“. In this process the prisoner is stripped naked, with a heavy board laid on their body. Then rocks or boulders are laid on the plank of wood. This was the process of being pressed. After two days, Giles was asked three times to plead innocent or guilty to witchcraft. Each time he replied, “More weight.” More and more rocks were piled on him, and the Sheriff from time to time would stand on the boulders staring down at Corey’s bulging eyes. Three mouthfuls of bread and water were fed to the old man during his many hours of pain. Finally, Giles Corey cried out “More weight!” and died. Since Corey refused to plead, he died in full possession of his estate, which would otherwise have been forfeited to the government. It passed on to his two sons-in-law, in accordance to his will. In 1590, Giles CROMWELL’s (1603 – 1673 ) grandmother Susan Weekes, Lady Cromwell, visited the Throckmortons of Warboys and had an exchange of words with Alice Samuel in which Alice uttered the fatal words “I never did you any harm as yet”. Soon after, Lady Cromwell fell ill and died. Alice was tried on 5 Apr 1593 for the murder by witchcraft of Lady Cromwell. They were found guilty and hanged. Their property was confiscated by Lady Cromwell’s husband, Sir Henry CROMWELL, (Wikipedia) who used the proceeds to pay for an annual sermon against witchcraft to be preached in Huntingdon in perpetuity. At first I thought that Abigail (Martin) Safford (1676 – 1768) was our ancestor. It turns out she married John SAFFORD Jr’s. first cousin also named John Safford. Many genealogies combine or mix up these two John Saffords . Abigail had testified that she was afflicted by 13 different people in the Salem Witch Trials when she was a teeenager. At the grand jury she testified against Samuel Wardwell. She signed three indictments, those of William Barker, Sr., Mary Barker, and Mary (Osgood) Marston. At the grand jury she testified against Samuel Wardwell. She signed three indictments, those of William Barker, Sr., Mary Barker, and Mary (Osgood) Marston. Aug 1692 – a month before the arrest of Mary and Hannah, Joseph Tyler and Ephriam Foster filed a complaint against John Jackson, Sr., his son John Jackson, Jr. and John Howard of Rowley of acts of witchcraft against Rose Foster and Martha Sprage of Andover. About the same time, Moses Tyler and Samuel Martin accused Elizabeth Johnson and Abigail Johnson of using witchcraft to afflict Martha Sprage and Abigail Martin, also of Andover. In 1692, Samuel Martin, 47, husbandman; his wife, Abigail; and children were living in the north part of Andover. Abigail was pregnant with their seventh child. 8 Jan 1692 – Ralph Farnum II, who was Samuel Martin’s step-brother, died at Andover. John Farnum and Ralph Farnum III, both sons of Ralph II, testified against Martha (Allen) Carrier on June 28 and again on July 30. 25 Aug 1692 – Samuel Martin and Moses Tyler filed a complaint against Willian Barker, Sr., Mary Barker, and Mary (Osgood) Marston for afflicting Abigail Martin, Jr., Rose Foster, and Martha Sprague. Mary (Osgood) Marston was the daughter of Christopher Osgood. On August 25 at their examinations, Mary Bridges, Jr., Sarah Bridges, Hannah Post, and Susannah Post were charged with afflicting Abigail Martin Jr., Rose Foster, and Martha Sprague. 30 Aug 1692 – Elizabeth (Dand) Johnson confessed that she afflicted Sarah Phelps and three of Samuel Martin’s children and that her sister Abigail (Dane) Faulkner and Sarah Parker joined with her in afflicting them. about 31 Aug 1692 – Sarah Wardwell, Sarah Hawkes, Mercy Wardwell, William Barker, Jr., and Mary (Ayer) Parker were complained of for afflicting Abigail Martin Jr., Rose Foster, and Martha Sprague. 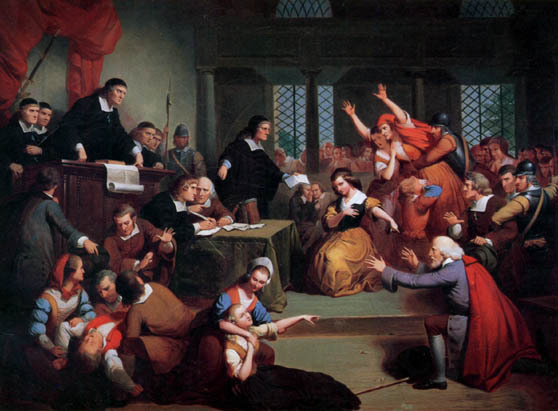 7 Sep 1692 – Abigail Martin Jr., and Ralph Farnum III were members of the afflicted circle at the Andover touch test. Abigail (Wheeler) Barker and Mary (Lovett) Tyler were indicted for practicing and exercising witchcraft against Ralph Farnum III on Sep 7. 22 Sep 1692 – Mary (Ayer) Parker, widow of Nathan Parker, was hanged at Salem. Her daughter Sarah had been imprisoned by August 19. Another daughter, Hannah Parker, had married, in 1682, John Tyler, brother of Moses Tyler. A third daughter, Elizabeth Parker, had married in 1684 John Farnum, who was the brother of the afflicted Ralph Farnum, III. Many sites and even some books state that Francis WYMAN (1619 – 1699) testified in the Salem Witch Trials that Margaret Scott of Rowley, “came to him and did most grievously torment him by choking, and almost pressing him to death, and he believed in his heart that Margaret Scott was a witch.” The accuser was actualy Frances Wicom. Richard GOULD’s grand daughter Mary Gould Reddington accused her ex-brother-in-law’s second wife of witchcraft. After Priscilla Gould Wildes’ death and his remarriage to Sarah Averill, John Wild was no longer a member of the Gould family. Mary Gould Reddington, started spreading rumors as early as 1686 that Sarah practiced witchcraft. During this period, the husband was totally responsible for anything and everything his wife did. Therefore, John Wild threatened to sue John Reddington for liable as a result of Mary’s gossiping if her accusations were not retracted. John Reddington begged him not to as he would surely lose everything. John Reddington assured John Wild that no further rumors regarding Sarah and witchcraft would come from Mary. The damage, however was already done. Sarah (Averill) Wildes (wiki) (1627 – July 19, 1692) was executed for witchcraft during the Salem witch trials. She was one of seven children born to William Averell. She married English immigrant John Wildes (born 1616) and had a son, Ephraim. Ephraim held the positions of town treasurer and constable during the period of the conspiracy. Constable Ephraim Wildes was ordered by the Marshall, George Herrick, to arrest Deliverance Hobbs. Hobbs, whether through coercion or not, made a jailhouse confession and implicated Sarah Wildes as a witch. Perhaps she made the accusation for spite of her arrest by Ephraim. She also accused several of John’s children. This opened the door for the power hungry leaders of Salem church to target John and descimate his family. The official complaint was made, of course, by Thomas Putnam. As this thing quickly blossomed with further jailhouse confessions with the hope of saving themselves, most of John Wild’s children were accused and it was by order of Marshall Herrick that Constable Ephraim Wild arrest them. Ephraim was probably not terribly popular at family barbecues from then on. The Marshall had some pity on Ephraim, however, and spared him from arresting his own mother. The Marshall did that job himself. John’s daughter Sarah and her husband Edward Bishop were arrested but Edward’s son paid off Sheriff Corwin to enable their escape from the jail to Rehoboth. All Priscilla’s living children were accused of witchcraft and arrested by their half brother Ephriam the town constable. The 1689 Boston revolt three years later was a popular uprising on April 18, 1689, against the rule of Sir Edmund Andros, the governor of the Dominion of New England. A well-organized “mob” of provincial militia and citizens formed in the city and arrested dominion officials. Leaders of the formerMassachusetts Bay Colony then reclaimed control of the government. In other colonies, members of governments displaced by the dominion were returned to power.. This entry was posted in History, Storied. Bookmark the permalink. These things are quite some work to put together, so I appreciate your taking the time to do it. The personal touch of familial relationship that binds American and regional history together casts a light…a gradation…that would otherwise be lost as time rolls relentlessly on.